Below are the images of the four dishes that I prepared. I had blogged Vegetable Noodles recipe earlier. Today, I’m blogging Vegetable fried rice recipe. The other two recipes will follow soon. 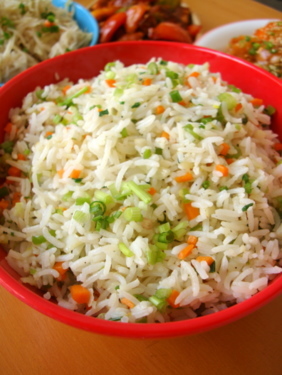 The vegetable fried rice I prepare is simple with minimal ingredients. I do not add soy sauce which imparts a dark color to the rice. 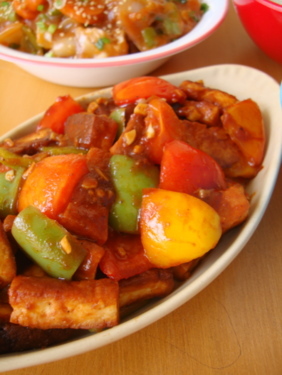 Do use capsicums as it enhances the over all flavor. 1 Heat sesame oil in a large wok and once the oil is piping hot, add the spring onion whites and stir fry for 1 mt on high. 3 Add salt and pepper pwd combine. Cook on high for a mt. Add the cooked cold rice and combine well. Spread it all over the pan and leave on medium high for a mt. Combine again, spread out and leave on medium high for another mt. 4 Add vinegar and toss all the contents on high heat for a 30 secs. Turn off flame. Garnish with chopped spring onion greens and serve hot. Finely minced garlic is an optional ingredient. Fry the garlic till well toasted followed by spring onions and follow the rest of the recipe. Try to use freshly ground black pepper. 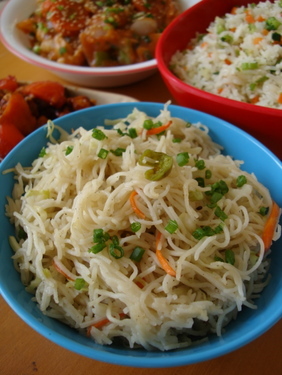 Always use cold rice or rice that has been cooked the previous night. Thanks for ur healthy recipe..
Sailu garu do u know how to prepare egg fry with black pepper n onion..
if so plz let me know otherwise i will tell in a simple way..
Sudha, we at home love eggs. 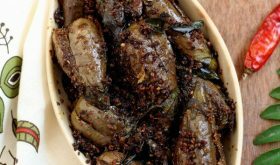 Do share the egg fry recipe using pepper and onions. Thank you. Just wondering since this recipe is from a chinese decent did you miss out soya sauce. Its a very imp ingredient in fried rice isnt it?? Yes, fried rice has evolved from the kitchens of Indo-Chinese descent. There are numerous versions. As mentioned above, I have omitted soya sauce to avoid the dark color it imparts to the rice. I also prepare another version of mixed fried rice where I use soy sauce. Looks delicious..I do the egg fried rice in same way….Set aside fried vegetables and scramble eggs add pepper and mix veggies and add rice in the end…If u need more detailed recipe please let me know…. Do share your detailed recipe, Neela. Thanks for sharing. thanks sailu for the wonderful recipe. your version of fried rice is wonderful. i like it. one thing is missing from ingredients is – ajinomoto- if you have purposely avoided it then it is nice. otherwise also consumption of ajinomoto is not healthy. thanks. 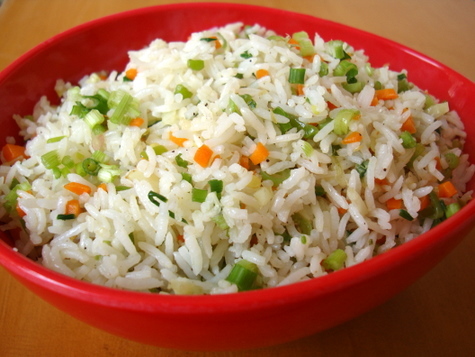 you have me craving for some fried rice now!! u need:cubed n diced onions,green chillies,eggs,turmeric powder,mustard seeds,zeera,curry leaves,salt,pepper powder,red chilli powder. Method:boil eggs first n do popu next add green chillie,onions fry them till it gets roasted now u can add turmeric poder salt red chilli powder n pepper powder n fry.now take eggs make them separate (i mean yellow n white) make egg whites into small pieces add these into fried onions fry them for about 2 mins. thats it. This is the way sailu garu i prepare..its simple n easy..n healthy too..
i do have pics but i dont know where to uplaod..
Lovely and delicious Chinese food spread. I use very little soy sauce and finely chopped ginger and garlic, as you say the Indo chinese version has evolved a lot so each recipe is different. Your version looks very simple and delicious. That’s a beautiful bowl of rice. Hi Sailaja… I visit your website everyday… and I’m not trying to flatter you by saying that your work and website is a feast to visitors eyes. Thank you for informing me. Its very unfortunate this is happening almost on a daily basis. 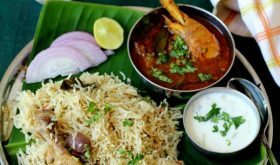 I am not too good at putting recipes because i don’t measure them properly while cooking….but I tried my best to come with measures…Since you are expert in cooking you can adjust the quantities according to your taste buds..
8. Add Chopped cilantro and enjoy the fried rice. If you try this recipe let me know how it turned out…. I was just browsing your site for some new recipe and although veggie fried rice is not new, it is always special when it comes from you. 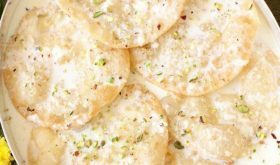 That aside, I have a question for you, do you send recipes for SAAKSHI? 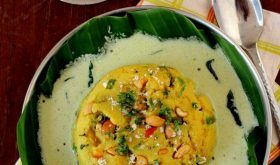 I saw the same pic, the same beatiful red bowl, and the recipe ofcourse translated into telugu, anyways was just curious to know if that was some plagiarism, or if it was just you? btw the fried rice really looks colorful, just what I need for my cravings filled first trimester. Initially, Saakhsi newspaper was using the content/images from my blog without seeking permission or giving due credit. This week they started giving credit to the source. Hi sailu, i am a fan of ur cooking! was wondering you havent given the recipe for the Vegetables in ginger garlic sauce and sesame seeds or am i seeing in the wrong place?? will wait for ur reply! I am a big fan of ur recipes. 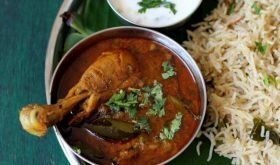 I have tried ur chicken curry, mutton curry, egg curry, etc. All tasted very gud. Tnx for ur recipes. It is very very gud. Keep doing the gud work. I followed your Veg Fried Rice recipe to the T .. and it turned out so light and flavorful.. exactly what I was looking for. I usually pair it with some store-bought veg manchuria. Thank you so much for sharing! u r really doing a wonderful job. i’m very much impressed with ur recipes. hello sailu garu i had seen u’r recipes in sakshi and then i started making some of the recipes. It’s wonderful and i have no words to say. u are stunning and doing a tremendous good job. I started cooking recently, i find your recipes very useful and easy to follow also. I tried this veg fried rice, it came out so wellllll.. thank you for the wonderful recipe. can u tell what vinegar u used..please reply…wanna try this recipe…i used to love this type of fried rice that is served in our restaurants…not chinese..but didnt get the recipe till now..so can anyone tell me what vinegar shud i use..??? vinegar is liquid and that taste would be sour , it look like a water… until we taste it we don’t know the diffrence… i hope u understand well. This came out very nice, thank you for the nice n simple recipe. It came out really good, thanks for the recipe sailu, post recipe for paneer dishes. I prepared this dish nd I can’t believe tht in wata way it stands well b coz making this dish involves nt wasting of any ingredient prepared the last night from the refrigerator! It was really really good n drives us t a new endeavour! Its amazing…..
MSG (Ajino Moto) can be added to impart an “umami” flavor as well. 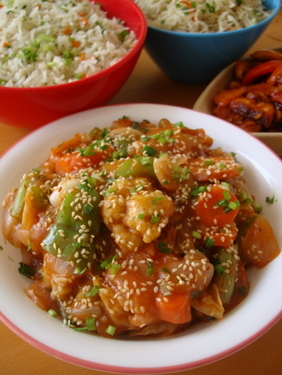 I tried this with the chicken manchurian (recipe from the same website)… both were awesome!!! I am so thankful to you for this recipe. I prepared this when I had my husbands America professor visiting us and they felt that it was wonderfully cooked. Thanks to you for the great tips and simple recipe. Thank you for the post, this is one of our favorite recipe.